Hogarth’s Pest Control specializes in Carpenter Ant removal. Also referred to as “the Michigan termite,” Carpenter Ants are very prevalent in Northern Michigan. They will attack any type of unprotected wood structure, including rotting fence posts, hollow stumps, lumber, and firewood. They enjoy moisture-damaged wood, which is commonly found around doors, windows, roof lines, and decks where no flashing is found. If you are finding sawdust around your home, it is likely that the Carpenter Ant is the culprit. Their bodies are black and segmented and come in all different sizes. To help with proper identification, you can find blonde hairs on their thorax or abdomen. Most commonly you will find the large ants in your home anywhere you have or may have had water damage, such as bathrooms or the kitchen. 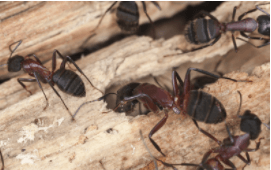 Carpenter Ants are mostly nocturnal and work within the walls of your structure. They can be found in the morning and later afternoon emerging from structures to forage for food, which is mainly insect honey dew and plant secretions. They will make a trail from your structure to a tree or plant, traveling up to 300 feet. It is very important to make sure that you do not have any tree branches or bushes touching the home, as this is a way for the ants to access. 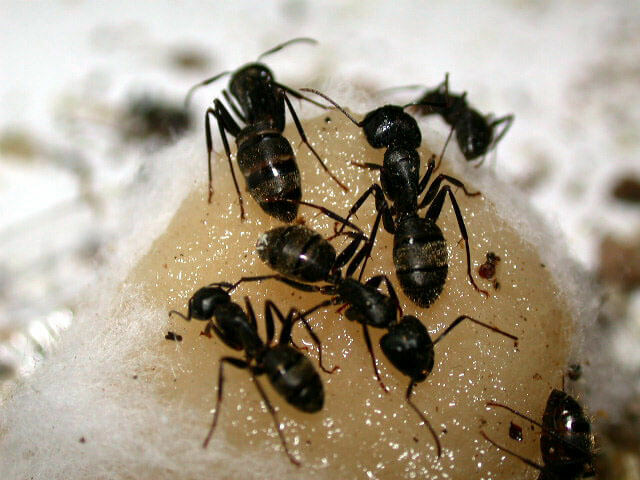 Carpenter Ants mate in a process called swarming. 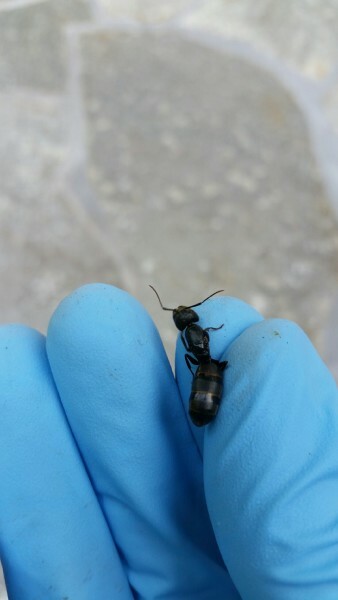 In the spring they produce winged ants that are potential queens that try to fly off and make satellite nests in other parts of your structure. The hatching process takes about a week. Most will exhaust themselves trying to get out of the structure and die, however the rest will make a nest, lose their wings, and begin to reproduce to start another colony. Trim branches and bushes from structure. Have an exterior preventative treatment applied to your structure. The best time to do is in the spring; however, if you have an infestation you should get treated by a professional immediately. It is highly advised that customers DO NOT attempt to spray or treat Carpenter Ants with store-bought products. This will drive the ants inside and cause a much larger issue than originally detected. Store-bought products are usually some form of pyrethrin, which acts as a repellent; this will cause the ants to avoid any area sprayed until the product has broken down. This can make it much more difficult to eradicate the ants once they begin using an alternative route.